This Hello Kitty set is an order from a former customer. When she emailed me to ask for Hello Kitty party kit, I was surprised that her daughter is now turning 2. It wasn't long ago that her daughter turned 1. Has it been really 1yr? Time flies by so fast! 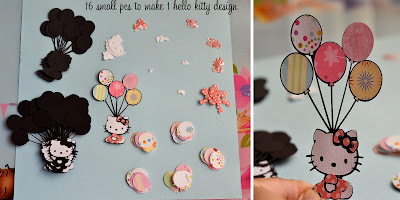 Here are the Hello Kitty Party Supplies I made for her: Invitations, Banner, Goody Bags (personalized with her daughter's name), Cake topper with her daughter's name and age, Cupcake toppers. Everything have matching design of Hello Kitty balloon..